This is a press release from Gates Carbon Drive. 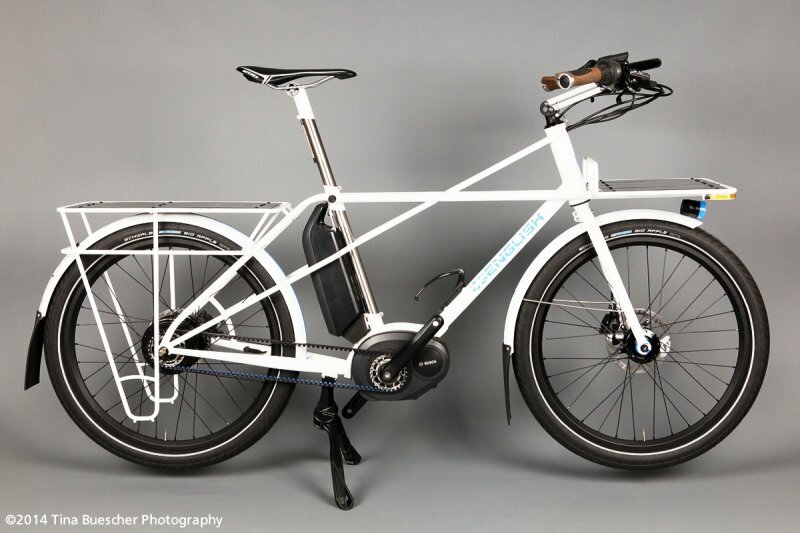 Gates Carbon Drive, maker of the leading belt drive system for bicycles and eBikes, plans to electrify the 2014 North American Handmade Bicycle Show with a first-ever “Custom eBike Showcase” featuring a dozen original electric bicycles. Gates partnered with leading electric bike system companies Bosch, SRAM, and BionX, as well as hub maker NuVinci, and enlisted some of America’s finest custom builders to create the belt drive eBikes for the show, March 14-16 in Charlotte, North Carolina. Award-winning builders participating in the showcase include Co-Motion Cycles, English Cycles, Calfee Design, Kent Eriksen Cycles, Ti Cycles, Dean Cycle Works, SyCip Designs, Boo Bicycles, Santana, Alternative Needs Transportation, and Connor Wood Bicycles. Gates and its partners Bosch, SRAM, BionX, and NuVinci gave the builders creative freedom to design eBikes to suit their functional and artistic visions. The belt drive eBikes cover a range of styles: fat bikes and cargo bikes, tandems, urban commuters, and electric bikes made of bamboo and hardwood. The eBikes will feature electric drives from Bosch, SRAM, and BionX, as well as NuVinci N360 continuously variable planetary hubs from Fallbrook Technologies. The Custom eBike Showcase marks the debut of the widely anticipated Bosch Gen2 eBike system in North America. “Electric bikes are one of the hottest segments for growth in the bike industry, and Fallbrook Technologies is excited to be a part of this showcase that introduces more Americans to this trend,” said Chris Vasiliotis, NuVinci product manager for Fallbrook Technologies. Sales of eBikes have doubled annually in Europe and the United States for the past several years. The chairman of the Light Electric Vehicle Association expects that trend to continue in coming years, with sales expected to hit two million in Europe for 2013. The Custom eBike Showcase exemplifies Gates increasing focus on the electric bike market, which is the largest growth category for Carbon Drive. In addition to Bosch, SRAM, and Bionx, Gates Carbon Drive integrates with eBike systems from MPF, GO SwissDrive, and Höganäs. Gates is working with Shimano, Yamaha, NuVinci, and Panasonic to provide belt drives for their eBike systems. 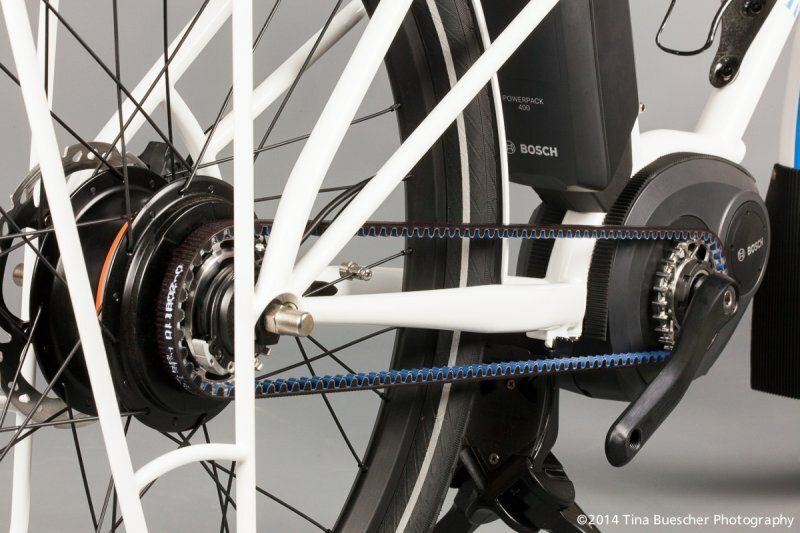 “Belt drives just make sense on electric bikes because they provide a clean and hassle-free solution,” Sellden says. Gates recently joined the Light Electric Vehicle Association (LEVA), the world’s largest trade association representing electric bicycles, to grow its presence in the eBike market. The North American Handmade Bicycle Show (NAHBS) is the world’s largest and most influential custom bike show and has a reputation for driving creativity and innovation. The Custom eBike Showcase, believed to be the largest selection of custom eBikes ever assembled, will be located in the Gates booth (#300) at the Charlotte Convention Center. Gates Carbon Drive is an official sponsor of the North American Handmade Bicycle Show. “Electric bikes are a new thing for NAHBS and custom builders, and I will be curious to see the reaction from builders and the public,” said Don Walker, founder of the North American Handmade Bicycle Show. Consisting of two lightweight metal sprockets and a high-strength belt embedded with carbon fiber cords, Gates Carbon Drive™ is a low-maintenance, chain-replacing technology from Gates Corporation, the global leader in automotive and industrial belts. Clean, quiet, light and strong, Carbon Drive requires no greasy lube, weighs less than a chain drive and will not stretch. Due to its low maintenance and ease of use, Carbon Drive is a technology that can get more people on bikes. Gates Carbon Drive will be featured on more than 220 bike models from more than 90 brands in 2014. Visit https://www.gatescarbondrive.com. End of press release from Gates Carbon Drive.